Our practices of careful observation begins in the vineyard and continues in the winery. We work with nature, and offer only minimal interference with natural processes. Utilizing wild ferments and intervening as little as possible, we let the grapes fully express themselves as they transmute into wine. The Margaret River region, in the southwest corner of Australia, is a biodiversity paradise. Our farm is located on rich bushland connecting to the Leeuwin-Naturaliste National Park, which extends down to the edge of the Indian Ocean. We work within the sound of the sea whose influence on the grapes is tangible. Cooling maritime breezes mitigate warm daytime temperatures, allowing our grapes to ripen slowly and to gather flavor. Animals of all kinds live in or visit the vines. Our practices consciously integrate the wild into what we cultivate. Everything we do is interrelated with the cycles of nature. The biodynamic approach considers the whole farm as an integrated, living system, with its foundation in the soil. A healthy soil retains moisture, is nutrient rich and alive with beneficial organisms supporting the vitality of the plants. We use homeopathic preparations, fish and seaweed emulsions, biodynamic composts, rock dusts, mulches and cover crops. Each vine is the purest expression of its particular variety. Because our grapes are grown on their own roots, developed from cuttings of the finest specimens available in our region, they have varietal purity and natural vigor. The vines are dry-farmed and never irrigated. They have found their own water and have thrown down deep roots. Self sufficient and deeply connected to the seasonal water cycles and natural processes inherent to our area, the vines are integrated expressions of this bio-diverse place. Utilizing wild ferments and intervening as little as possible, we let the grapes fully express themselves. We prune and trellis by hand and do not employ machinery. Our vines are on vertical shoot-positioned trellises and are closely planted in short rows. The vigor of an entire plant concentrated in a tiny space allows for a finite low volume of intensely flavored fruit. We believe this close-planted arrangement best brings out the inherent flavor of the land. We pick by hand to prevent damage to the fruit, and transport small quantities at a time to the winery to insure freshness and viability. Our practices of careful observation, working with nature and offering only minimal interference with natural processes, begins in the vineyard and continues in the winery. Our Australian online store is currently down. Please contact us directly to place your next order. Sorry for the inconvenience. The 2010 Vintage was preceded by a winter of abundant rains. The growing season, however, was warm and dry, resulting in excellent fruit set. Hot summer days coupled with cooler nights worked magic on the Chardonnay, which was harvested at the end of February. Our 2010 exhibits exquisite balance, flavor and concentration. The 2010 Vintage was preceded by a winter of abundant rains. The growing season, however, was warm and dry, resulting in excellent fruit set. The hot weather moderated during March and April, leading to perfect ripening conditions for red varieties, characterized by excellent deep color, superb fresh flavor, well-balanced acids and silkily mature tannins in our Cabernet Sauvignon. The 2011 Vintage began after a fairly dry winter followed upon by a dry spring. Some relief arrived in January with some light rains. This was followed in February and March by extremely hot summer days, with quite unusually warm summer nights, speeding up the growing season. 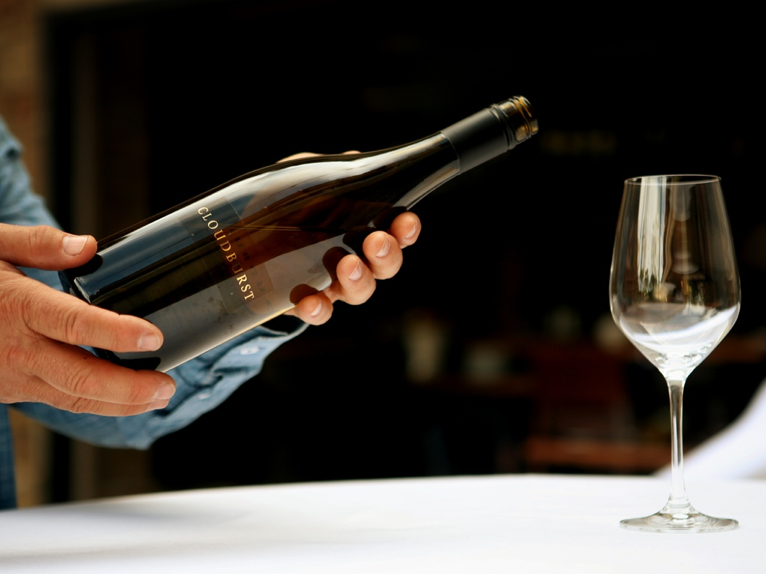 The resulting 2011 Cloudburst Chardonnay has a powerful intensity of flavor and a refreshingly stony line to the palate. The 2011 Vintage began after a fairly dry winter followed upon by a dry spring. Some relief arrived in January with some light rains. This was followed in February and March by extremely hot summer days, with quite unusually warm summer nights, speeding up the growing season. The 2012 Vintage repeated 2011's hot conditions, with warmer than usual nights accelerating the time of vintage several weeks advance of its usual timing. The heat created intense flavors in the Chardonnay and it was picked earlier than previous years, enabling the retention of strong natural acidity and great freshness and length. The Cabernet benefited from the moderating temperatures which arrived towards the end of vintage, developing intense fruit flavors with well ripened tannins, assuring great longevity. Spring 2014 was the rainiest so far for Cloudburst, yet was characterized by consistently mild temperatures. The vines took off with great vigor immediately after pruning, and had an extended and perfect flowering. This was followed by a warm and dry summer, gracefully free of excessive heat spikes. This consistent warmth, coupled with mild nights and low velocity maritime breezes, resulted in deeply flavorful grapes. Virtually no rain fell during the first few months of 2015, which created perfect ripening conditions. All grapes were hand harvested and completed wild primary and secondary fermentations well in advance of the heavy rains which arrived in late March. A vibrant wine of great depth and purity, the 2015 Cloudburst Chardonnay has a mineral intensity and effortless length that resonates and captivates. This is a powerfully delicious wine, with gorgeous complexity and outstanding balance. A concentrated honeyed marzipan confection melded with dark peach, acorn, roasted chestnuts, peanut skin, river stone, brioche, butterscotch and Meyer lemon curd. A powerful, yet graceful wine of great purity, texture and complexity, the 2014 Cloudburst Cabernet Sauvignon has striking vitality, opulence and generosity. It sets the palate alive. This is a delicious, clean, intense and ripe wine, with a vitality that is simply lovely to drink. The wine is profoundly perfumed, with violets to the fore, floral yet fleeting, followed with blueberry, black olive and bayleaf, a mahogany bass note, and a suggestion of anise and lifted exotic spices. In the palate, the wine is fine, glossy, and concentrated. It is a precise and pure miracle that frolics between flavour and texture, at once a silken sheet and web of light -- cedary tannin underlays a richness of delicious ripe mulberry fruit, with black olive and chocolate and tobacco leaf and satin cassis dancing with a flourish of spice that extends all the way to the astonishingly long finish. A densely flavored, deeply layered, majestic wine with tremendous vibrancy, the 2014 Cloudburst Malbec is absolutely delicious. From the first aromatic sniff, to the fantastically long finish, it is a wine that satisfies on every level. Intense, yet poetic, the wine is an inky magenta, with terrific weight. This wine is a perfect melding of crème de violette, damson plum, baked apple, mocha, blackstrap molasses, ripe black cherries, boysenberries, blackberries, and black currents. A line of hickory smoke, dark wet tobacco and black pepper adds mystery, depth and grip to a very rich, delicious and alluring wine with a profound and satisfying finish.